Non-Denominational – All Are Welcome! The Sanctuary in the Chapel of the Archangels is an artistic and architectural masterpiece built in the Gothic style. This building convention uses a system of buttresses (the vertical pillars), and flying buttresses (the curved arches), to support massive amounts of weight over a large open expanse without internal support. The resulting domes are breathtaking, meticulously hand-detailed, and provide an environment rarely seen today. The acoustics are unsurpassed. And what Chapel would be complete without stained glass? Our original windows are incredibly detailed and was lovingly handcrafted over 110 years ago. Many of them proudly bear the family name of the parishioners that donated them. 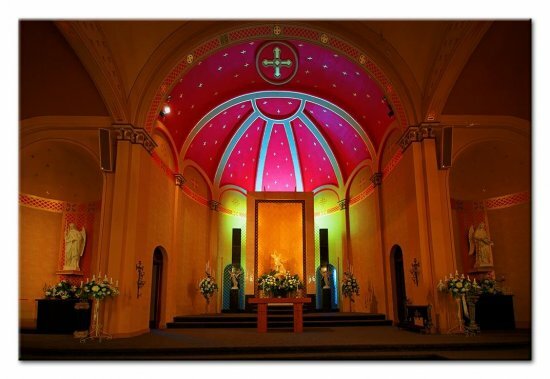 The rich colors pour light into the sanctuary, adding a peaceful glow. Eventually, we also plan to re-open the view of the massive rose window in the bell-tower (rose windows are also an indication of the Gothic style) which has been hidden behind a wall and plywood for many, many years. Rest assured that your attendees will be talking about the Chapel long after your event, and be thrilled that you impressed them with this venue!